From the joy on this couple's face, it's hard to believe their wedding day was rained out by a tropical storm! There was only a little bit of rain when guests were escorted under umbrellas to the ceremony on the private pier. As the couple exchanged vows, the winds blew stronger and the waves grew larger. During the reception, the storm became intense and then everyone had to be evacuated from the outdoor tents to the spa due to flooding and high gusts. Nevertheless, the couple and their guests had an amazingly positive attitude and treated the entire day as a wonderful adventure - rain soaked outfits and all! The staff at the hotel were incredibly upbeat and efficient at making sure everyone was warm and dry. Once settled in the ballroom after a brief delay, the festivities started again with even more enthusiasm! This image of the bride and groom was photographed in the lobby of the hotel where it was sheltered, though the winds still blew the bride's veil dramatically. 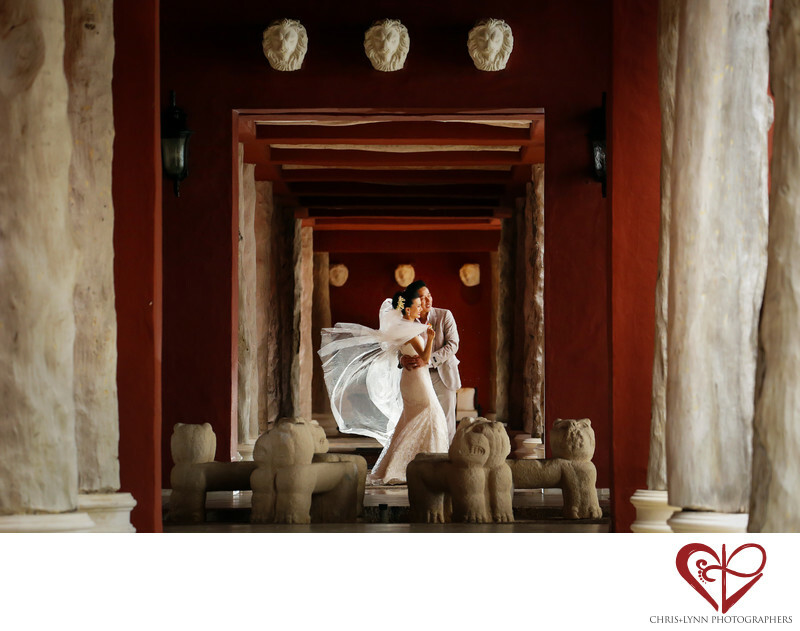 We loved the lion statues on the floors and walls of this location and the vibrancy of the red walls - also a lucky color for Chinese wedding couples. 1/100; f/4.5; ISO 1600; 150.0 mm.